I’m not sure why, but I like flowers. I know this is not the most manly thing for a meat blog to disclose, but it’s true. I like flowers. I like rolling fields of them, turning abreast in the morning sun. And I like the little one’s too, that roost on a single stem, all by themselves. I like the flowers men get for their sweethearts in February. And I fancy the lanky lilies down by the pond. I even like dandelions, for what they’re worth. Weeds to some, but pretty even so. But what I really like are petunias. I have some petunias which lavish the flanks of the pond-side pit, delicate and dainty, and they are my daily reminder of what is lovely in this world. In the misguided haste of youth, I remember using my mother’s petunia garden for traction in many a game of backyard tag. Today, however, with advanced years, I’m more inclined to pull up a chair and tarry a spell, and wonder why I hadn’t been doing this all along. I like flowers. 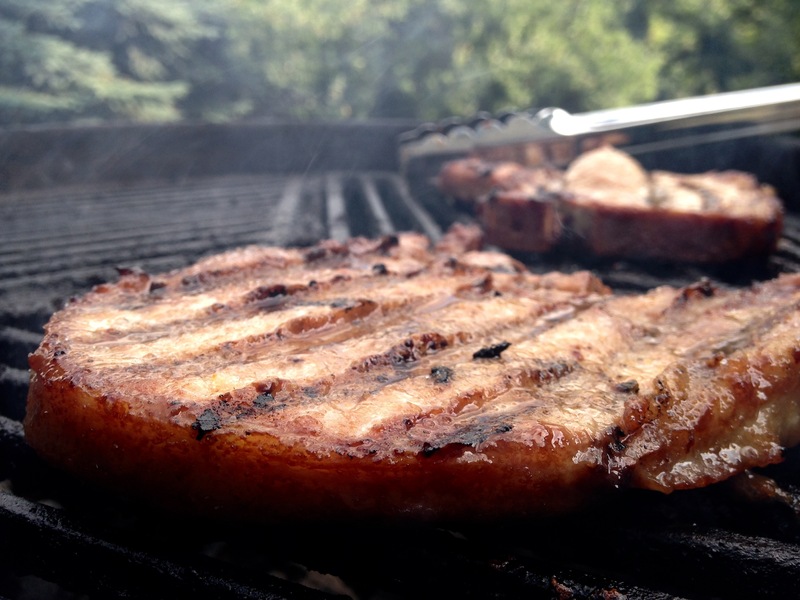 And as these chops sizzle over a beautiful bed of hickory-accented coals, I hope you don’t mind none if I ruminate a touch more on the softer things. You see we get it rough enough in this life just having a pulse. 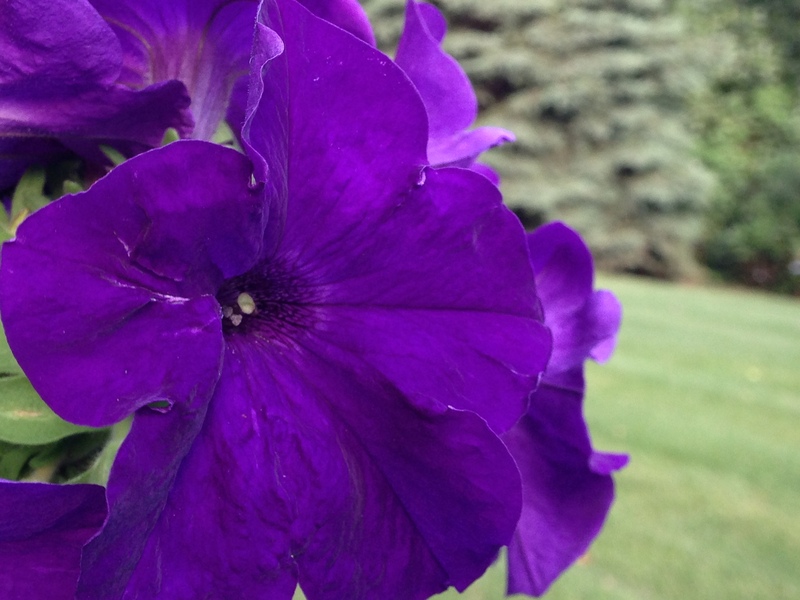 Your kinda of born by default into your share of the unsavory, and just when you think maybe the world is a whole lot of unfair, you come across a purple petunia to direct you otherwise. There they be, fragrant and fragile, beautiful but bold. Bold in their soft, but showy arrangements, which thus flirt in proud contrast amid the many sprawling weeds of life. Maybe that’s what I like about flowers. I like what they stand for. Of unmerited goodness in a world fallen. They’re just plain wonderful is what they are. And they put up with you too. These Petunias are good to me, even when I forget to water them. There is much grace in their little purple petals. Much patience, kindness and forgiveness. They didn’t have to be this way, you see, but they are. And that’s what makes them great. Kind of like they were created just for you, seems like. And as the season ebbs on, some how, through the grace that be above, they seem only to get better and better. Yeah, I like flowers. I smiled as I reached for a manly beverage, whilst summer clouds idled overhead. And just then, rather unexpectedly, my lovely bride pokes her head out the patio door just to say hi, and boy howdy, if I don’t get them same gooey petunia feelings all over again. Golly… Blessed is the man with both pit and petunias and a sweetheart there to share them with. Speaking of the pit, about these chops. They are your simple bone-in affair, delicious, and highly pleasant to do. They started a couple of hours ago with a swim in a tasty homemade honey & garlic marinade. After the marinade, we placed them semi-ceremoniously upon the hot cast iron grate, opposite the hot coals. The cold protein sizzled to life there, as a light shroud of hickory smoke curled into the air. A portly bumble bee buzzed by, as I plunked on the old, enameled lid. The draft soon engaged, and I settled back into my patio chair again, feet up, icy beverage in hand, taking up the resident pit master posture that might otherwise be mistaken for a fellow doing nothing. These are the high rigors of BBQ, people. Somebody has to do it! Watching the wood smoke curl there, and listening to the song birds trill in the evening light, one can’t help but to appreciate all these little things which abound. From the frogs sounding like so many rubber bands, warming up down by the pond. To the way the summer breeze flutters the cottonwood leaves, clacking gently there, under an endless, blue sky. Then to the aroma of perfectly executed pork wafting through the tomato plants. The way the crescent moon peeks around the darkened spruce tops, and how at day’s end, sunlight washes over the freshly clipped grass in a scenic flood of amber and gold. All of these “flowers” , if you will, and many more simple wonders, are always there, I’ve noted, iffin we have a mind to see them. They tarry in life’s quiet eddies, tingling to be noticed. That’s how flowers work, don’t you know. They’re only as useful as the soul who embraces them. You gotta slow down for them tho. It’s Okay to yield for flowers. Nay, it’s our privilege. Amen. Hickory Smoked, Honey Tinted Pork Chops hot off the Pit. Man! Grill on comrades! Go forth and grill likewise, and do so with great exuberance! This entry was posted on July 14, 2015 by Patrons of the Pit. It was filed under Cooking and was tagged with barbeque, bbq, cooking, food, foodie, gardening, honey marinade, nature, poetry, pork chops, writing. Man, now I want Pork Chops, but I’ve already committed myself to Steak Frites and a salad for our evening repast. Aloha PotP! Well that sounds like fine eating by me! You sure know how to live. Aloha Auntiedoni! I love that you love flowers and I am especially fond of petunia’s also. Those pork chops are awesome. Well thanks! I bet a lot of men secretly like flowers. And some not so secretly. They’re just pretty. That’s all there is about it! Men can and should appreciate beauty! It’s a real man that admit that! Ah good to hear of another unashamed flower loving man! I know how harsh and long your winters are; what man would not be touched by the signs of a season which sees that lake of yours thaw and life return to the soil again? A man in touch with the gentleness as well as the power of nature seems to me like a guy who is at peace with the world and himself. I love your posts and am sorry for my absence. My cat Otto died and the balance in my little world went out of kilter. But the flowers are blooming here too and it makes a real difference. Thank you, Karen of Devon, England! As always, concerning your comments, I thank you for your thoughtful prose. They make my day. And you are one I certainly look up to in high regard in the gardening realm. You’ve got it down to an art. An opus even. I love perusing through your blog as well. My condolences regarding little Otto. He sounded like the perfect friend for you, at the perfect time in your life. Another flower in your life, to be sure..
Great post, my friend. I, too, love flowers. I often feel sorry for the poor dandelions of the earth. We pull them. We spray chemicals on them. They are somehow considered the bane of a lawn keeper’s existence. Never mind their beauty or their usefulness. And I love pork chops as well! lol. Just served a party of ten with my near–famous chops from the Weber yesterday. Now I’m excited to eat them again with an attempt at your honey garlic marinade. Sounds fantastic! Very cool, thanks Duncan! Sounds to me like you’ve been making good use of your new Weber. It’s the infatuation stage that you’re in now. The honeymoon period with your pit. I’d like to tell you it goes away after a time, but I’m not so sure it does anymore. 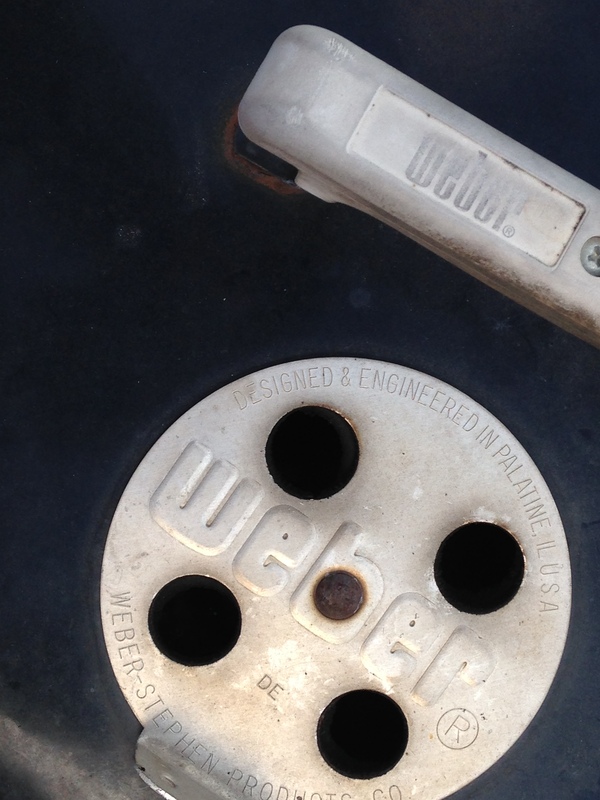 Weber makes a good grill. We are only limited on it by our imagination, and our wit! Great sentiments on the lowly dandelion. As usual, you articulate your thoughts well. Take care, Duncan. Always a treat to hear from you! We are restricted on what flowers we can have since the deer own the yard. My poor poor hydrangeas look pitiful nothing but stubs and no blooms this year whatsoever (sigh). The marinade sounds wonderful!! 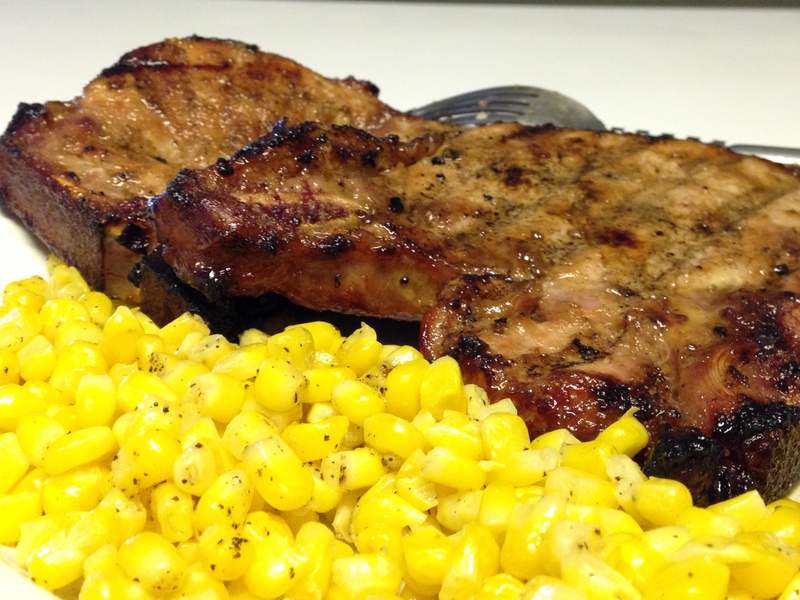 We had pork chops last night, but they weren’t grilled and probably no way as good as these! Them darn deer. Perhaps venison steaks are soon for your grill! It’s hard to sit by the pit and not admire the beauty around us, rather it be an ancient oak (my personal favorite), a bird flitting nearby, a beautiful sunset, or a well laid flowerbed. All of these things are beautiful of their right, but somehow in the relaxed state, truly standout. Deep insights from Mr Dodd. Thanks man. Nicely said! Yup there’s just something about loitering around a puffing pit that sets a soul at ease. Love it. Anything baked in honey,is a winner! You speak the truth, Miss Dinie! I actually felt hungry looking through the pictures!